It’s an annual event for me and it’s really lovely to meet up with other makers, especially those of us who have been doing it for a long time. It is hard work but good fun, and always nice to see my customers, many of whom feel like old friends after all these years. I am not sure what the collective name for red kites is but I have a flutter of them to take with me, along with a selection of most of my collections. My days in the run up are long and the nights are short, but I’ll get there in the end. 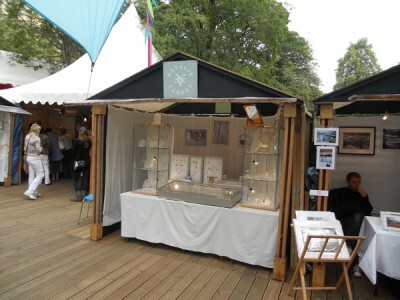 It’s always great to see all my jewellery finally neatly displayed on my bright white stand.